A designer range of unique checks you can order online. Featuring adorable Rockford sock monkeys on an ordinary check book, a side tear check book, check book cover and sock monkey address labels. Four fun designs to chose from, monkeys in the classic "see no evil, hear no evil, speak no evil" positions, monkeys relaxing and dancing. 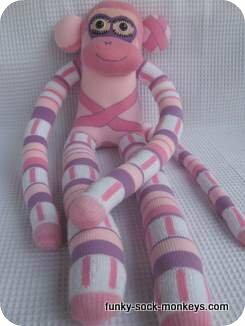 All of the sock monkey artwork is beautifully designed and as cute as ever! 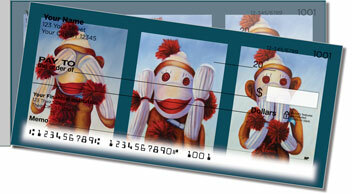 Go bananas for these sock monkey checks (cheques). 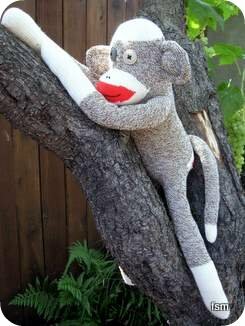 With their characteristic red lips and unique personalities, it's no wonder we go bananas for sock monkeys! 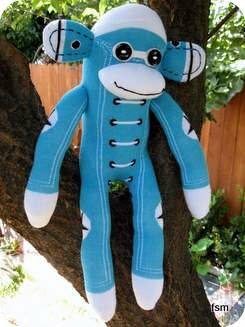 Show your love for this iconic nursery companion with these sock monkey personal check designs. 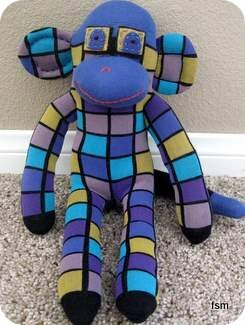 Sock monkey art designed by Shannon Grissom featuring cute sock monkeys in four unique check designs which allows you to have a bit of monkey fun every day. These sock monkey designs are just as practical as they are playful, why not make paying bills more fun the ever with these premium-quality printed checks. It's important to add some fun to our day, even if it by doing something as simple as writing a check out that is covered in sock monkeys. It's fun for us when we write the check, we'll not the fact that we are sending money away necessarily but fun looking at the monkeys and it's a bit of fun for the person receiving the check. Lets get down to business - sock monkey business that is, by keeping our sock monkey checks safe with a sock monkey checkbook cover. Available in either top grain leather or cloth. 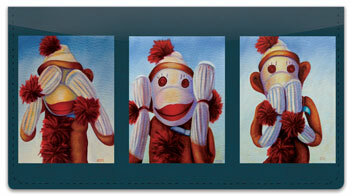 Share some fun with these sock monkey address labels. These high quality address labels are available in quantities of 180, 360 and 720. Chose from the four fun artwork designs. When you use these sock monkey mailing labels on your envelopes, holiday cards and more you know you are adding more than just your personal information. You are adding smiles! They're just fun and they are perfect for hundreds of jobs, so don't wait! 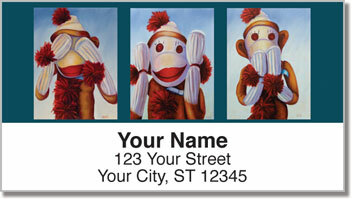 Share some funky monkey fun with some personalized sock monkey address labels of your very own. Get yours today! Unless you don't need any right now, then just get some when you're ready. You can create your very own personalized checkbook cover.